When South Korea’s Constitutional Court finally upheld the impeachment of President Park Geun-hye, ousted for cronyism and corruption, the massed protesters who spent months demanding her resignation breathed a collective sigh of relief. Their country can now emerge intact from a serious political crisis – and the light of its democracy still burns bright. Or does it? Park’s impeachment, triggered by the Choi Soon-sil corruption scandal, wasn’t just a career-ending personal scandal; it also revealed fundamental flaws in South Korea’s constitutional setup that a change of president alone cannot fix. The country has already been without an elected leader for three months, and there are still two more months to go until the public votes for Park’s replacement. This could scarcely be happening at a more inconvenient time, since the country faces all sorts of other challenges. Among them are President Trump’s flip-flopping on US support for Seoul in the face of North Korea’s nuclear tests and missile launches; Chinese anger with South Korea for deploying the THAAD (Terminal High Altitude Area Defence) missile system; and corruption charges linking Park’s office to the industrial heart of the Korean economy. Combined with the uncertain political climate, these all threaten to send the country spiralling into the abyss while lumbered with a system of government that’s showing some dangerous cracks. Public attitudes to Park were always deeply divided, not just on the question of trust – or rather, the lack of it – but along generational lines, too. For many older South Koreans, a vote for Park was a vote for her father, assassinated president and strongman Park Chung-hee. In the younger Park, they saw a symbol of economic success through enormous sacrifice. Her impeachment undermines their trust in the Korean political system and their faith that the sacrifices were worth it. For those who have come of age in democratic Korea, Park’s impeachment is an appropriate end to a presidency that threatened to turn back the clock to the bad old days of high-handed rule and human rights abuses. Corruption is just part of the problem. Park’s tenure was plagued by a series of crises and controversies, including infringements of freedom of speech, blacklists of prominent cultural figures, and allegations that she bungled the response to the Sewol ferry disaster. These are exactly the sort of political divisions that a democratic system is supposed to help channel and reconcile. But the Choi scandal tested that system to breaking point: it brought raw emotion into the public realm in a way not seen since the pro-democracy movement of the 1980s, and Korean democracy was unable to properly channel that massive outpouring of emotions. With that failure, it proved that the Korean Constitution, the country’s last bastion of democratic legitimacy, doesn’t hold up under pressure. Much of the problem stems from the way power is divided at the top. Chapter four of the South Korean Constitution regulates the role and powers of the executive. This system is “semi-presidential”, meaning that power is shared between a popularly elected president and a prime minister confirmed by the National Assembly. Or at least, that’s how it works on paper. In reality, the system empowers the president. As in other countries with semi-presidential systems (such as France or Romania), the balance of political power is strongly influenced by the way the constitution is interpreted, meaning political culture plays a crucial role in determining how the system works in practice. South Korea’s particular political culture has created a sort of imperial presidency in which the president controls every aspect of the executive and their own party, giving them a strong grip on the legislature. This is precisely the dynamic that played out in the Choi scandal, which lit a flame under the public discontent that had been simmering in Korea’s body politic. Park and her party were defeated in the legislative elections of April 2016, underlining the level of public discontent with her leadership, but she ploughed on with business as usual. The anger, resentment and suspicion that greeted her actions needed a release valve, but only Choi’s arrest ultimately provided it. This is not a trivial problem. Arguably the most important part of a democratic state’s constitutional framework is to provide a safety net in times of constitutional and political crisis. In this respect, the South Korean constitution failed. 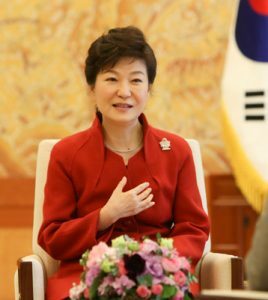 Some commentators, comparing South Korea to North Korea, have hailed Park’s impeachment as itself indicative of a successful democracy. But the system was failing to respond to the political will of the people long before the Choi scandal broke. Small surprise then that it ultimately failed so badly as to leave the country without an elected leader during a time of intense regional instability. Clearly, the system needs to be fixed. But instead of throwing the baby out with the bathwater and reforming the whole constitutional system, South Korea must simply decide how it really wants its political system to work. Given the security threat from North Korea, a strong leadership with popular legitimacy and complete control of the military is probably the best option. But at the same time, the country would benefit from upgrading the role of prime minister from first head on the chopping block to a position of real power and responsibility to the legislature. A meaningful counterweight to the president, a beefed-up prime ministerial office would introduce some badly needed pluralism and openness to government, and empower the National Assembly and the party system. That in turn would give the country’s civil society an effective voice, and channel raw public emotions into the constitutional system. But as yet, no such fundamental change is afoot. Park continues to deny wrongdoing, and the candidates to replace her are lining up for May’s elections. In the meantime, the domestic and international challenges are mounting, and all eyes are still on South Korea. What are Korean Totem Poles?